Welcome to this week’s update. I hope you have been enjoying the sunnier days we have had this week. Pupils in Year 4 and Year 3 Magpies certainly have as they have spent some time down on Bexhill seafront as part of our ‘Beach School’ program. Pupils have enjoyed using materials and resources to design and make shelters, protecting them from the sea (and the sun) and learning how to look after the beach in a careful and sustainable way. The children have had great fun, learned lots and I know that they will be looking forward to going again! Our new ‘Pod’ is getting lots of use. 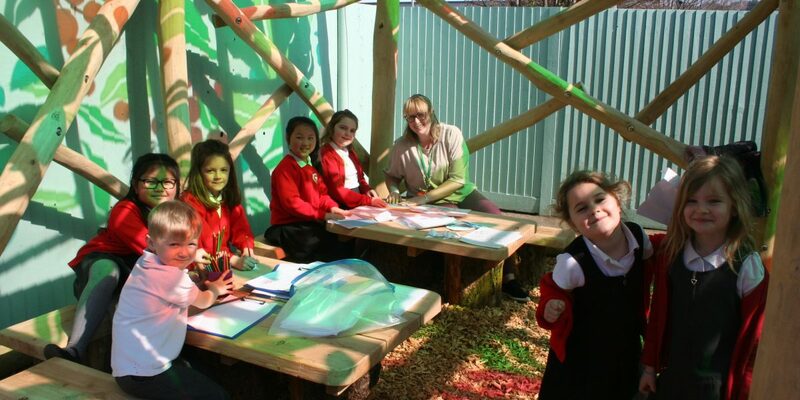 Our new outside classroom is used at break and lunchtimes, as a quite space to read, play games or talk with friends. Staff in school have also used the space for smaller group work for reading, writing and maths and is absolutely perfect on a warm and sunny day…like today! We are looking forward to our new scooter pods arriving shortly – this will help to keep all of the children’s bikes and scooters safe and secure whilst on the school site. I’ll let you know more about this when they arrive. Pupils in Year 1 have had lots of fun with reading this week. They have started a new reading program called ‘Daily Support Reader’. Every child will read as part of a small group each day, for 30 minutes, and always with an adult, helping and guiding them through the stories. There have been some really lovely activities taking place. It’s only in its first week so I’m sure that as the children get used to it they will make even faster progress! Well done to all of our winners! In the weekly ‘Attendance Raffle’, Najmah S in Year 6 was this week’s winner. Well done, Najmah! This term’s ‘Attendance Challenge’ in both key stages is extremely close. With just one week to go, Year 1 Turquoise, Year R Blue and Year 2 Yellow all have 26 points, with Year R Red just four points behind. In Key Stage 2, Year 3 House Martins continue to lead the way but have just a five point lead over Year 4 Kestrels and Year 3 Swallows. Brooke K in Year 6 was awarded this week’s ‘Sports Personality’ award for her outstanding achievement in Swimming. She’s recently won some gala events for her freestyle swimming. I’d also like to take this opportunity to say ‘Well done’ to Mrs Taylforth who completed this year’s Hastings Half Marathon at the weekend, with an impressive time of 2 hours, 9 minutes. She has also raised nearly £400 for her chosen charity! Well done to Brooke and to Mrs Taylforth. Just to remind you that next week is the last week of term which means that we will be hosting our Paragon events in school (the timetable is on this week’s Bulletin). I do hope that you will be able to join us! Thank you to Miss Standivan and Miss Scott who complete their teaching placement today. They have spent the past weeks in Year 4, working hard and learning to be excellent teachers. Year 4 would like to say ‘Thank you’ and ‘Goodbye’. Finally, we today say ‘Goodbye’ to Mr Coleman. Mr Coleman has been an absolute credit to the staff team here and has supported children in Years 4 and 6 during his time with us. He has shared his exceptional maths knowledge and his love for Leeds United with us and leaves King Offa with our best wishes. We wish Mr Coleman well for the future.